Driving is a huge part of nearly everybody’s responsibilities. Whether it’s going to the grocery store, commuting to work or heading to a relative’s house over the holiday, many of us will spend a huge fraction of our lives behind the wheel of a car. Shouldn’t it be fun? The 2018 Mazda MX-5 Miata RF brings fun back to driving – that same feeling of enjoyment you had the first time you got behind the wheel of a car and knew you had an unlimited path ahead of you. With a sleek convertible hard-top, striking exterior design and plenty of standard technology inside, the 2018 Mazda MX-5 Miata RF makes even the most mundane trips something to look forward to. Providing just as much excitement and heart-pounding exhilaration with the top down as it does sophisticated and dynamic driving with the top up, the 2018 Mazda MX-5 Miata is a driver’s car through and through. Don’t wait another day. Test-drive the Miata RF today and return the thrill to everyday driving. Click here to shop our Miata inventory! The 2018 Mazda MX-5 Miata RF is ready to transform any drive into an exciting and fun event. The MX-5 Miata RF’s spirited 2.0L SKYACTIV®-G 4-cylinder engine sings beneath the stretched out and sporty hood allowing you to accelerate with quick response. Whether you prefer the engaging SKYACTIV®-MT 6-speed manual transmission with short-throw shifting or the precise and smooth SKYACTIV®-DRIVE 6-speed automatic transmission, you’ll enjoy every shift in the 2018 Mazda MX-5 Miata RF hard top convertible. The composed rear-wheel drive drivetrain allows you to take corners and straightaways with superior handling and control. With the fun you’ll be having, it’s hard to believe you won’t have to pay for it at the pump. The 2018 Mazda MX-5 Miata RF is among the most efficient in its class with a staggering 35 highway miles per gallon for the automatic transmission and up to 33 highway miles per gallon for the manual*. Finally, your sports car fun perfectly continues into the cabin where the 2018 Mazda MX-5 Miata RF provides some of the best comfort and convenience features available. Standard from the base Sport model up are push button ignition, heated seats with 3 heat settings, leather-wrapped steering wheel and more. Your entertainment experience will allow you to enjoy every mile as well with standard Bose® 9-speaker audio system with AudioPilot® driver and passenger headrest speakers and subwoofer. The Mazda Connect™ infotainment system gives you a 7” full-color touchscreen with multi-function commander control, HD Radio™, Pandora® and more! The 2018 Mazda MX-5 Miata RF is a sports car built for fun that also happens to be a sensible choice and a huge value. 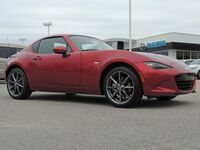 For more information on the 2018 Mazda MX-5 Miata RF or to schedule a test drive, contact us today! *EPA-estimated mileage. Actual results may vary. Click here for more 2018 MX-5 Miata RF info!